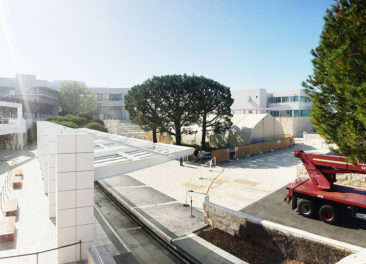 When I most recently visited the Getty Villa, one juxtaposition initially struck me as odd. On the one hand, the Roman artwork that most intrigued me was the front of a sarcophagus belonging to a relatively humble woman and man, Gaudenia Nicene and Titus Aelius Evangelus. Among the sarcophagus’s different scenes are apparent references to Evangelus’s occupation, as wool is combed, wound, and weighed by figures sitting near the panel’s left and right ends. On the other hand, the sarcophagus is displayed within a museum whose layout largely derives from an enormous Roman residence, the palatial Villa of the Papyri near Herculaneum. It is the kind of building that could only have been owned by someone of Rome’s very highest echelons—a senator or a member of his family. People like Evangelus and Gaudenia would have only on the rarest occasions made their way into this sort of villa. The pairing of artwork and structure, then, felt odd, since it combined works of Romans from near opposite poles of the social spectrum whose lives may never have intersected. On further reflection, however, this association of low and high is perhaps not so jarring, since, even as Evangelus and the villa’s owner wouldn’t have encountered one another, the worlds of Rome’s lowest and highest social strata very much informed one another. For one thing, Evangelus and Gaudenia present themselves as enjoying a lifestyle that was not all that far removed from the pleasures of a luxury villa. That is, in addition to the wool-working scenes, the sarcophagus’s sculpture packs many perks of fancy Roman life into the composition. 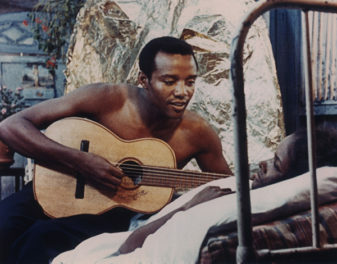 One of the deceased is shown wearing a toga (which was reserved just for citizens) and reclining on an elegant couch with lathe-turned legs. The cup in his left hand and the bunch of grapes in his right suggest that a festive dinner is in full swing; further confirmation lies with the three-legged table holding a fish and an uncorked bottle resting below the couch. His wife Gaudenia returns Evangelus’s cheerful gesture with a toast of her own. In other words, the central scene shows them living the high life. Faced with upstarts like this, those perched atop Rome’s social pyramid sought ways to counteract the threat. One strategy was to classify only one’s own behavior as appropriate, and thus to define others’ acts as déclassé. If we trust no less an authority than the great statesman Cicero, elite Romans perpetuated the story that wealth properly derived from landholdings, not from commerce or from what they disparaged as sordid trades, a category under which wool-working would likely be classified. This struggle points up how—to a degree that we perhaps don’t appreciate as twenty-first-century Americans, cruising past one another’s neighborhoods from the distance of interstates—Romans of all stripes were very much mixed up in one another’s lives. 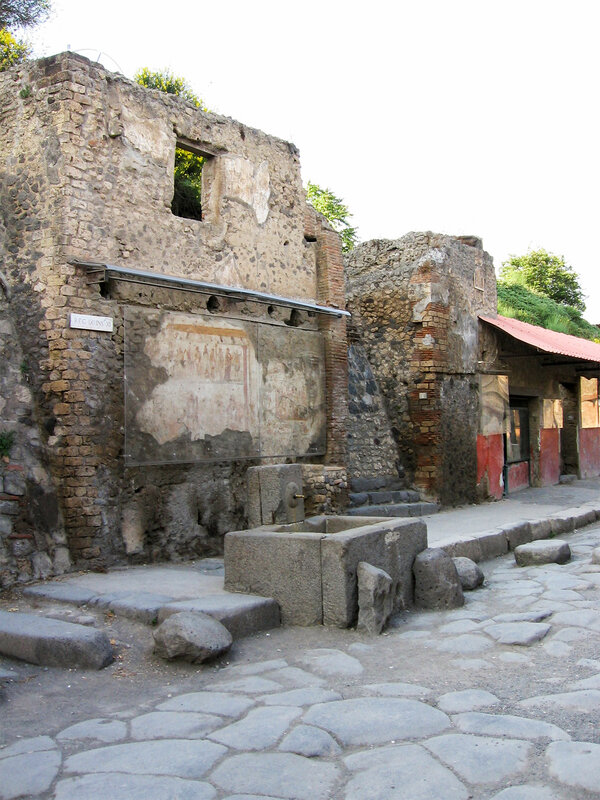 If we were to look at just about any city block in Pompeii, for example, we would see a jumble of workshops, bars, and houses, both small and large. Even within large dwellings, it wasn’t as though small nuclear families rattled around echoing spaces. Rather, big houses held big households, and the elite were constantly surrounded by slaves, former slaves, and dependents of all other sorts, who shared their housing, attended to their needs, or managed commercial enterprises for them (thus insulating them from “dirty work”). That proximity didn’t mean that all Romans led similar lives. In fact, Romans were highly conscious of the social hierarchy, and took nearly every opportunity to spell out differences. When a community gathered in the theater or amphitheater for a play or for arena events, for instance, society was literally stratified by legal status. The highest ranking, such as senators or someone like the villa’s owner, got the primo seats near the action, and the poor were relegated to the nosebleeds (if they made it in at all). We might think a similar situation still obtains today, but there was a crucial difference. Back then you couldn’t save up your sesterces and plop down courtside at the ancient equivalent of a Lakers game next to the Roman Jack Nicholson; this was a matter of the law. The differences even extended to where and how Romans of different statuses ate and drank. 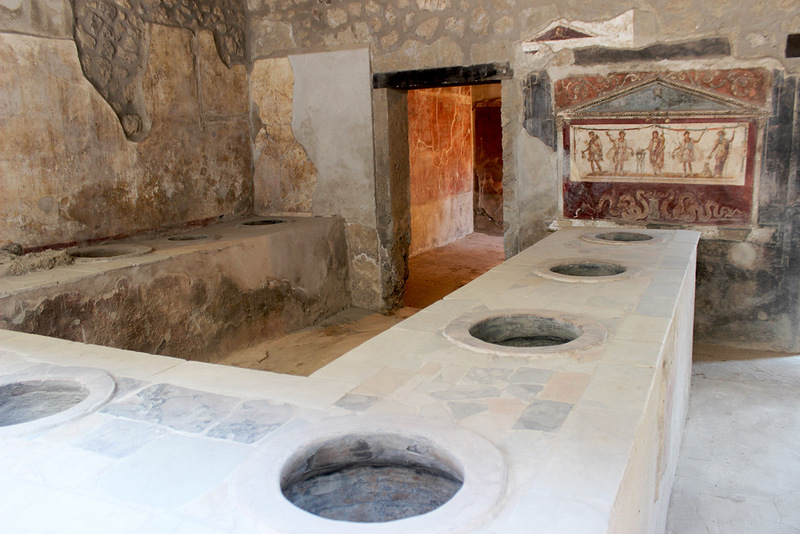 Pompeii had more than 150 taverns, or one for about every 75 people that lived within the city’s walls. That density of eating-and drinking-establishment finds its closest parallels with cities in today’s developing world: There is one street food vendor, for instance, for every 50 inhabitants of Iloilo in the Philippines, and one for every 70 in Manikganj, Bangladesh. In Pompeii and today, such proliferation it reflects a reality in which—because of the danger of fire, the annoyance of heat, the likelihood of spoilage, and the demands of work—many lower-class folk found sustenance outside their homes. 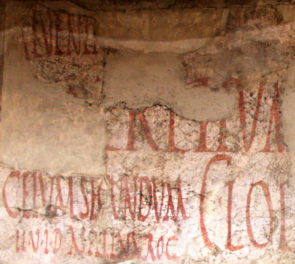 Though many of the Roman bars were decorated with paintings that tried to class up the experience, we shouldn’t think of them as restaurants. Rather, as in our American world, many of the urban poor were more likely eating from the ancient equivalent of the “dollar menu.” In fact, our elite literary texts deride these establishments as low-class haunts rife with what they characterized as immoral behavior. 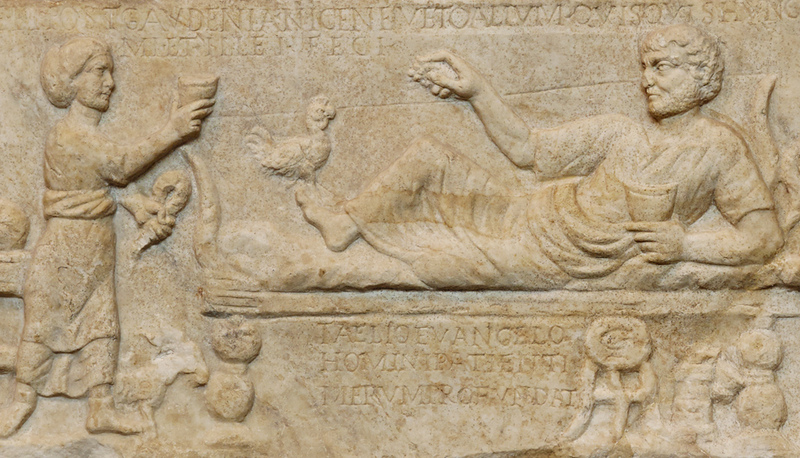 Dining and reclining, as Evangelus portrays himself doing, was a luxury largely reserved for the elite. This situation grows all the more intriguing when we consider Evangelus’s and Gaudenia’s names, which (some scholars argue) reveal them as freed slaves, or at least descendants of freedmen. In contrast to slavery in the American South, slavery in ancient Rome was not always a life sentence, and manumitted slaves on occasion gained great wealth. So, in addition to an obsession with hierarchy, Roman society also had a fair amount of social mobility, which complicates the interplay of low and high all the more. In the end, my initial reaction to the sarcophagus in the Getty Villa reminds me of a statement made by the architectural historian Spiro Kostof. He contended that we cannot understand an American antebellum mansion without also examining the slave shanties that stood on its grounds. Kostof’s emphasis on a building’s “total context”—not just its physical structure and material components, but also its social environment and other cultural factors at play—may be all the more important to bear in mind for Romans and their art/architecture. Because Romans of all classes lived in such close proximity and were constantly wrangling over how everyone stacked up, we can’t simply look at the sarcophagus or the ancient villa in isolation. Rather, when I deliver the public talk, Beyond the 1%: How Everyday Romans Lived, on June 11 at the Getty Villa, one goal will be to shed light on the daily lives of slaves, freedmen, and their lower-class compatriots at Pompeii and elsewhere. But, in so doing, I also hope to grant audience members some perspective on life in a grand structure like the Villa of the Papyri—for that perspective only really emerges when viewed in juxtaposition with life outside its palatial confines. I’m associate professor of classics and Andrew T. and Anne Ford Chair in the Liberal Arts at Wabash College, and a specialist in Roman archaeology and social history. Extremely interesting. I hope your 11June lecture goes well, and that you keep us informed of your researches.